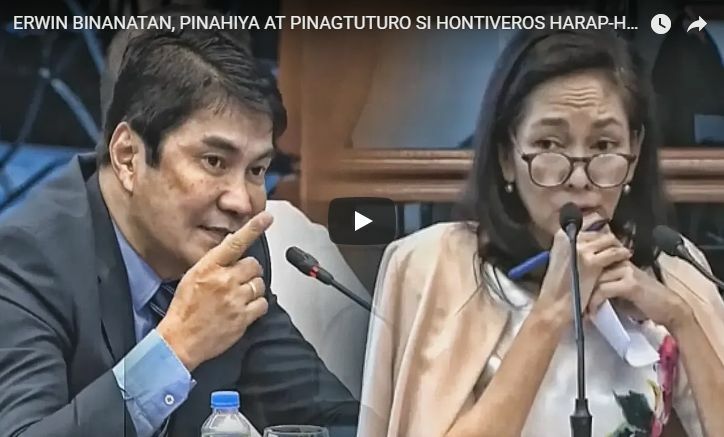 One of the country's most prominent journalist and TV host, Erwin Tulfo burned down Risa Hontiveros during the Senate Hearing on the controversial Department of Tourism Ads, instead of interrogating the brilliant journalist it was Sen. Hontiveros who was put on the hot seat. According to Erwin Tulfo he just wanted to correct the statement released earlier by Sen. Risa Hontiveros against Bitag Media and the kind of work the journalist was assigned to in the said media company managed by Ben Tulfo. Erwin Tulfo was quoted as saying "Gusto ko lang pong i-correct si Sen. Hontiveros, Ma'am wala ho aking sinabi na hindi ko isusoli di po ako kasama, medyo na late po kasi kayo kanina." "Sabi ko I am not part of Bitag Media Unlimited, I am not a producer, I am not a regular employee, so, wala ho akong kinalaman, talent po ako." Tulfo stated. The veteran TV host also noted that "Besides, sa sinasabi, I don't know were you got the statement na hindi ko isusoli, hindi nga po ako naging part ma'am eh, how could that be, isa pa po ma'am, medyo mali ho kaya, kinu-correct ko po kayo ma'am, with all due respect, hindi ko po sinabi na hindi ko isusoli." Tulfo noted. During the said hearing, Ben Tulfo also explained that there is no conflict of interest in the said transaction between PTV-4 and Bitag Media Unlimited, but the statement of Tulfo was interrupted by the chairman of the Senate Blue Ribbon Committee, Sen. Richard Gordon. According to Ben Tulfo, based upon the slides presented by Sen. Gordon, how come his program Kilos Pronto as the least popular in the May 6 to August 14, 2018, PTV ratings, but Kilos Pronto was no longer aired since April. Sen. Gordon finally admitted that maybe there's a mistake with the facts presented by his staff. Ben Tulfo also clarified that there's something wrong with the statement made by Sen. Risa Hontiveros who stated to the Tulfo Brothers that they should do the right thing.